The first time we heard of Poonam Singh, she was just 15 years old and a finalist in the GT&T Jingle and Song Competition. Poonam really wowed the judges and the audience, but she eventually lost out to Brandon Harding of Linden. Clearly 2011 was not Poonam’s year, but 2016 so obviously is. 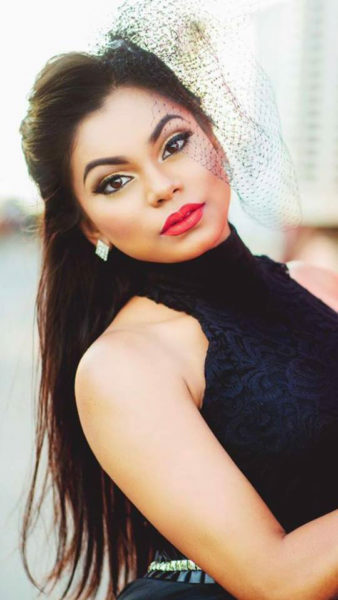 Poonam has been selected to represent Guyana at the Miss Global International pageant, which is scheduled to be held in Mauritius. After being held in Jamaica for ten years, the pageant was held in Trinidad and Tobago last year and is now billed for Mauritius. Poonam’s platform for the pageant is ‘Eradicating Suicide’ and it was chosen by the Miss Global International Guyana team, since it is an area that Poonam has been targeting on Facebook. 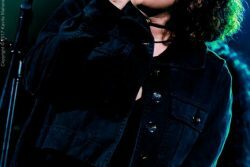 Sometime ago, she had posted a video of herself on her Facebook page of her original song, “Life is a Gift.” The video, which targets persons who are depressed and having suicidal thoughts, has had over 160,000 views, but something else happened. 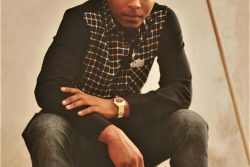 “Instantly I started getting messages from persons. Every day I find time to respond to messages from persons with those kind of thoughts. Sometimes I wait until I get home or while waiting on a teacher who might be a few minutes late. All that matters is helping that person. There’s so much more we can do and it should not be taken for granted,” Poonam said. She hopes that as the new Miss Global International Guyana and with her platform she can have the support from doctors, artistes and lawyers and other influential people to tackle the suicide issue here in Guyana. 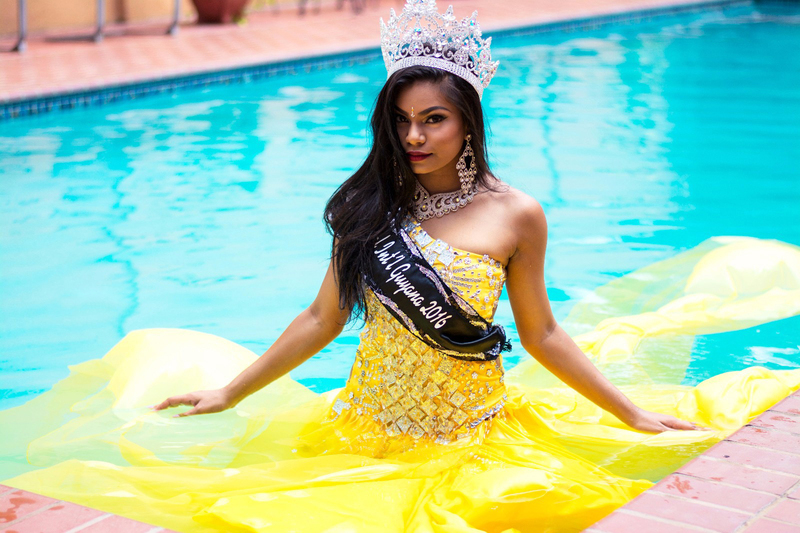 After undergoing a screening process last September, Poonam was contacted by Managing Director of Miss Global International Guyana, Hashim Ali inquiring about her interest in pageantry. She was crowned by Miss Global International Guyana 2015 Alicia Bess on February 20 at a simple Coronation and Gala Ball held in the ballroom of the Guyana Marriott Hotel. The Miss Global International Pageant is slated for September. The reigning queen was once a student of the McGillivray Primary and Patentia Secondary schools. While at Patentia, she was a head prefect, but always seemed a timid person so when she had auditioned for the Jingle Competition, one friend asked what she was doing up there, wondering how it was that she mustered the courage to enter the competition. The songwriter is also a devoted Hindu and would visit the Mandir with her family every Sunday. Past Gita competitions would have seen her participating. She had to memorize as much as 72 verses from the Bhagavad Gita and was the champion three times in a row. 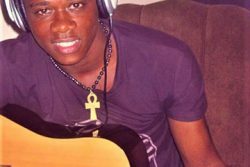 The singer has been writing songs since grade three. “I have two singles out so far. I have a ‘gazillion’ of unfinished songs but only like a hundred finished ones,” she said. She enjoys listening to singers from all different genres such as the band Magic, Coldplay, Taylor Swift and even singer Alkaline. Austrian and American actress, model and inventor Hedy Lamarr, who died in 2000 at the age of 85, has recently become Poonam’s greatest inspiration. Poonam said that after happening on information about Lamarr, she realized the two had a lot in common. Lamarr was said to be the most beautiful face of her time and was photographed wearing a half-veil, as was the fashion then. Poonam has done a photoshoot wearing a similar veil. Although she hasn’t a pet she wishes she had a goldfish. When it comes to food Miss Global International Guyana 2016 enjoys seven-curry, sweet meats, sweet and sour chicken, Popeye’s and for dessert chocolate truffle cake. She enjoys watching movies that have a proper storyline. Her favourite shows are “Quantico,” “Orange is the New Black” and “Fringe”. Poonam has a Diploma in Communications and is currently pursuing a degree in Law at the University of London through Nations University.